Morning Musume is a group whose members had traditionally changed constantly year over year, but the recent nine-member configuration was the longest-lasting lineup in the group's history, lasting roughly 2 years, 8 months with no changes. That all came to an end last night with the graduation of seventh-generation member Kusumi Koharu (17) at the final stop on the 17-city "NINE SMILE" tour. Over 2,000 fans filled Tokyo Kousei Nenkin Kaikan to capacity to cheer Koharu on as she left Hello!Project, where she's been since 2005. The final show's venue was chosen before Koharu's graduation had been decided, so given the venue's capacity, tickets for the show were probably quite a hot commodity. Morning Musume's producer Tsunku was at the show, as well as MM graduates Nakazawa Yuko and Iida Kaori, and they've all blogged about the event (Yuko / Tsunku / Kaori). It's also been reported that Yoshizawa Hitomi attended the concert as well. 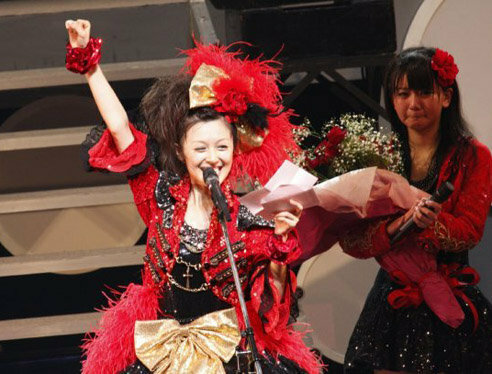 The crowd was flooded in red penlights, Koharu's color, as they chanted for her at the end of the concert. Her final solo song was "Furusato", the song she sang on the episode of Hello!Morning where she was chosen as the sole member of 7th gen. After that performance, the full nine-member group appeared again and performed "SONGS" and "LOVE Machine" to close the show. Fan recordings of the concert have been made available, and turbos86 was kind enough to translate all the messages from the members to Koharu from the graduation ceremony. He translated a preliminary fan report on the H!O forums earlier, but this is the revised, word-for-word translation from the concert recording. Enjoy! After Rainbow Pink, the audience does a 3 minute Koharu Chant. Koharu runs back on to the stage. Koharu: Thank you everyone!!! Wow!!! It's completely red! (Glow sticks) Thank you. Thank you very much for the warm Koharu call! Thank you! Everyone in the 2nd floor, thank you too! I, Kusumi Koharu, on today, Decemeber 6th would be graduating from Morning Musume and Hello! Project...will graduate. Everyone who has supported Kusumi Koharu of Morning Musume, I thank you from the depth of my heart! Ai-chan: Ok, here you go! Koharu: Thank you very much. Ah, I'm so happy. Koharu: It smells so good! Ai-chan: Hehe, congratulations on graduating. Koharu: Thank you very much. Koharu: I don't like where this is heading. Ai-chan: That's true..... At times I've gotten angry at you, I've praised you, and even weird things beyond imagination! But of course you've always put on a serious face when listening. I've seen so many side of you... This is the first time I have to see a kouhai go, so it's a very uneasy feeling. (Holding in tears again) I really want to congratulate you... but I can't help but to feel lonely. You must promise to do your best ok? Ai-chan: Keep in touch with us from time to time ok? But I'm sure you're not going to! Koharu: What? I will I will I will!!! Ai-chan: Because you're not the type to let others know that you are lonely. Ai-chan: You never say you are lonely.... Anyways, I hope that you can keep going forward as yourself. As your senpai, that is all. Congratulations! Koharu: Thank you very much! Ai-chan!!!!! Koharu: So this is how a graduation is like huh? Gaki-san: Koharu, congratulations on graduating! Gaki-san: And in the 10nen Kinentai. Koharu: and in 10nen Kinentai. We've always been together. Gaki-san: That's right... Do you mind if I give you a message instead? But, to me, Koharu was a very cute kouhai. Even thought you were hard to handle at times, but I really love you. It's going to be difficult being on your own, so be grateful to people who help you. I hope you will keep going and continue to be yourself. Gaki-san: Let's go do that at the Karaoke! Gaki-san: That's the wrong mood, we can't be always crying. Eri: Um yes...oh, this is Kamei Eri. Koharu-chan, congratulations on graduating! Eri: We were the "just right" comrades, being different from others right? Eri: Do you mind if I do the talking. Koharu: Oh yeah! That's right! You still have a lot to say. Koharu: I feel the same way. Koharu: At first, when I first met you, I thought you were scary. I was not good at dancing at first, you've taught me a lot...(Sobbing) So you stayed behind to help me...even thought that was with your own spare time... You've practiced with me... For the song, HOW DO YOU LIKE JAPAN, there was this dance move (Shows it to the crowd). But no matter what, I wasn't able to do it... But Kamei-san, you taught me a way to do it, when you told me how to move my legs... Ah, so that's how you do it! Eri: Let's move on here. Alright alright alright! Eri: Oh! I remember that! Koharu: Thank you for teaching me! Koharu: You've made it very easy for me to learn the dances...thank you very much! Eri: Ouch, thank you. I'm really glad now I know so clearly about how you feel about this! Congratulations on graduating! Do you best! Okay? I love you! Koharu: Thank you very much! Eri: This feels unreal! Do your best! Koharu: What should I do... Shige-Pink! Koharu: What to do, there's no time left. Sayumi: Like...hehehehhahaha (Half sobbing/half laughing) I'm laughing... To be honest, I hated you. Koharu: WHY! WHY! WHYYYY! WHYYYY????? I'm sorry I had to trouble you about fixing my FAX machine and all. Sayumi: It makes me feel lonely. Sayumi: But honestly, it's something that I don't have, so I really respect you for it... You've gave me so much laughter, we were able to perform as the legendary unit, Rainbow Pink...On the first day of this tour, when you announced your graduation, during that MC, I've realized how you have grown... It made me very happy, therefore, please keep on growing..... AHHHH, see you! (Tries to run away) I'm sorry! Koharu: Can I say something good about Michishige-san as well? Michishige-san, for being a poison tongue character, (Sayumi starting to cry) that's actually not true, you actually have a very kind heart. Even though Kamei-san has taught me lots, you've done so as well. Going into various little details. Sayumi: I'm sorry, I was being too detailed. Koharu: Not at all. Really...you're a kind person. Sayumi: Your sister said that right? Koharu: That's right, my sister said Michishige-san is a kind person. Sayumi: Thank you... Do you like Sayumi? Koharu: THANK YOU VERY MUCH!!! Thank you for doing Rainbow Pink with me! Sayumi: Thank you for giving me the ribbon, I'm so happy. Koharu: It is messing up your hair? Sayumi: No thanks to Koharu. Sayumi: I forgive you. Let's both work hard ok? Reina: Koharu smile, com'on! YAY!!!!! Reina: (Mumbles while trying not to cry) I'm sorry, it's hard to hear me... I wasn't planning to cry during the ceremony..... Since you're crying... I can't help keep it in either. When you first joined, I looked after you not about work, but about your livelihood. At first, I'll say this now, you didn't get off to a good start, being not able to dance properly, etc. You only joined because of having a cute face...but eventually, you were even able to shine brightly doing your own solo work. We would of never seen that if you didn't join. And then, even when you were in a pinch, you never showed a troubled face in front of the others. I'm really happy you trusted me to show your weaker side, asking me to have talks over dinner meetings. (Crying again) I like your "just right" character. I can't help to say that I'll feel lonely without you here, but please do your best!!! Koharu: THANK YOU VERY MUCH!!! Koharu: Tanaka-san, no doubt you have a scary character, but your heart is actually so hot....so warm... We've been through so much... I want to thank you for worrying so deeply about me..... I'm glad that Tanaka-san is Tanaka-san. We've got to experience so much, being members together. I really looked up to you... Please stay good friends with me. Reina: That's right. Do your best! YAY! Aika: Up till now, I was about to see Kusumi-san... I envy how you can always keep cheerful. Isn't heartbreaking to hear it's "just right", being viewed from a distant... seeing how you were always asked, "Are you listening?" and even being a nuisance. And you'd answer, "Oh is that so?" It's hard to understand how you can always seem to be so care-free. Even after being told, you were still always so cheerful, and I think that's great. I really look up to you for it. It feels good when I hear your voice. I hope we can have warm talks together again. Please continue to be yourself from now on for no matter what you'll be doing. Congratulations on graduating. LinLin: It's finally my turn.... Congratulations on graduating. LinLin: Since I've join, I felt the 9 of us are like family. Kusumi-san...even thought you are my senpai, it never felt that way. Koharu: I'm sorry I wasn't able to teach you much, being your senpai and all. LinLin: Don't worry about it... Remember to write me. Koharu: We'll go hang out. JunJun: Honestly, at first, Kusumi-san, you were hard to handle. Koharu: NO WAY! NOO WAY! JunJun: More like, you were too self-centered. Koharu: Wha...NO WAY! Wait a minute! Earlier, I invited you to go eat together, but you turned me down. Koharu: No! Hold on a second! No! Koharu: No, before that, you turned down for having chocolate fondue together. JunJun: That's why, when we were hanging out, when you were standing in front of me... At those moments, I really wanted to hug you. But I thought you'd for sure say, "JunJun, you're so gross! ", so I gave that thought up. Koharu: It's fine, it's fine. Let's do that now. JunJun: Nothing... Let's go eat together, ok? Don't say no when I ask you next time, ok? Koharu: I won't say that. JunJun: If you're feeling bored and want to fight, call me. Koharu: That's right, you won't have anyone to fight with anymore. JunJun: I wouldn't know what to do. Koharu: If you need someone to argue with, you can argue with Tanaka-san. Koharu: Please take care of her for me! Reina: Ok, you can count on me! Ai-chan: Everyone, really really thank you very much! Gaki-san: December 6th, 2009, here, in Tokyo Kousei Nenkin Kaikan, Morning Musume Concert Tour 2009 Autumn, 9 SMILE FINAL!!!!! Gaki-san: Today, honestly, we were able to have a very Koharu style graduation ceremony. The 9 of us has been together like this for the past 3 years, dancing and singing on this stage. I could feel deep in my heart, all the people who have supported us all this time! From now on (Looks to Koharu), are you listening? Gaki-san: Koharu, you'll be going off on your own from now on, and the 8 of us will always continue to work hard. Please continue to support Morning Musume and also Kusumi Koharu! Gaki-san: Today, I sincerely thank you for being here! This was Niigaki Risa! LinLin: Everyone on the 2nd floor, thank you for your cheers! Everyone on the 1st floor, thanks for dancing along with us! Kusumi-san, WO AI NI! (I LOVE YOU, In Chinese). LinLin: Everyone, WO AI NI! LinLin: Thank you very much, this was LinLin! Aika: Having all the smiles gathered here, I was able to have a wonderful time. It's the first time I have sweats running down my nose. I had a lot of fun, this was Mitsui Aika! Reina: It's the first time a graduation has so much laughter, isn't it Koharu? It's all thanks to Koharu! Well, we've also cried, but we want to end this with a smile. This time, it feels so surreal, to me, it still feels like there's more. Like, I can't believe Koharu is graduating. During this tour, I was able to have a free talk corner with Sayu. Today, I originally planned to talk about something like my hobbies and such, but when it was time for the real thing, since there was no rehearsal for that part, we felt like we didn't know what to do. There were lots of happening like this. And also, Otome gumi and Sakura gumi, it's the first and last time for Koharu isn't it. Oh this is going off in the wrong direction, forget it. I'm glad she was able to join in on that. I really had an enjoyable time during this tour. Thank you everyone! This was Tanaka Reina! Sayumi: Everyone, for coming to see the 9 member Morning Musume, for coming to see the 9 of us, thank you for coming all the way here. For Michishige~ (Doing her lines from the opening of Rainbow Pink) I am really glad we got to do Shige-Pink and Koha-Pink at the very end. We were very happy for it. Also, this was something that only the two of us could do. Koharu: Let's sing it again sometime. Sayumi: Yes please. Therefore, maybe we'll get copied... or it will even be performed in Shinjin Koen. Sayumi: But! The original Shige-Pink and Koha-Pink can never be replaced, so I am glad we were able to perform Rainbow Pink at the end this time. Also, with all the smile gathered from this tour, I will use that power to become even stronger! Thank you everyone! This was Michishige Sayumi! JunJun: It was a lot of fun meeting with everyone here today. Everyone, remember to wipe off all your sweat so you won't catch a cold, ok? JunJun: Always be by my side, alright? JunJun: Thank you very much, this was JunJun! Eri: This was Kamei Eri! Koharu: Everyone, thank you for the glow sticks! This might be the first time I can see so much red every where! I'm so glad you all came! I don't think there are more caring fans than you guys. It's the guys wearing them isn't it, and putting my name on it. Like, guys are not good at these things right? Having to carefully sew everything on, it must of took forever. Doing all this for me, I don't think there are fans like this else where. One very loud wota: I LOVE YOU KOHARU! Koharu: And holding like 2, 3 glow sticks, isn't it heavy? But still, you guys were jumping up and down for the 23 songs with it. 23 songs! You guys are so strong! Doing all these things for me. I'm really thankful to the fans. I want to thank you all one by one. I'm grateful to this extent. Thank you all of you for everything these 4 years! Please keep on supporting me from now on! Koharu: THANK YOU EVERYONE, THIS WAS KUSUMI KOHARU! Ai-chan: This 9 smile tour which began on September 19th, was able to finish without a hitch. Also, we were able to have a very Koharu style graduation ceremony. I am very glad. It was all thanks to everyone who came to cheer us on. Thank you very much. Ai-chan: From now on, Koharu and the rest of us will be working hard, improving ourselves, so please continue to support us! Thank you so much for today, this was Takahashi Ai. Gaki-san: So, it's really going to be the last song. Please listen. Gaki-san: Please remember the 9 of us like this, Love Machine. Ai-chan: Thank you very much! All: This was Morning Musume! Koharu: Thanks for all the glow sticks! Koharu: Please continue to support me. I'm glad to have been able to meet with you all. Bye Bye, Bye Bye, Bye Bye!!! MM runs back onto the stage. Koharu: Thank you!!!! Thank you!! Ai-chan: Everyone, thank you very much! Koharu: Kusumi Koharu is graduating here now. Please continue to give your support to me and Morning Musume! Ai-chan: Everyone, let's meet again next year! All: Thank you, bye bye! Fans ignores the announcement and continues to chant Koharu's name. Koharu: Can't I? I want to go back out! Staff: It's over, it's over. Staff: Hold on a second. Is the manager here? Koharu: No no no no?? I can't? I wanna go out~~~ I wanna go out! Staff: Hold on, the decision hasn't come yet. Koharu: I wanna go out~! I wanna! Staff: Hold on, hold on, the decision is coming. Koharu: I want some water, I want some water. Staff: Decision coming, it's coming. Staff: Hold on, everyone is going back out. We're letting everyone go out. We're letting everyone go back, hold on. Koharu: Eh, maybe it's not allowed. Koharu can't go back out alone? Can't go back out alone, just Koharu? Staff #2: You may go back out alone, but without a mic, to the center of the stage, do your salute, and then come back. Koharu returns to the stage one final time. The audience rejoice.